In recent months, the idea of an alternative mode of transportation has started to make headlines. Back in March, Dubai announced a pioneering initiative to employ a fleet of automated aerial vehicles (AAV) for public transportation means. Furthermore, at Uber’s Elevate Summit, the company announced their plans to roll out a network of AAVs in both Dallas and Dubai by 2020 as an expansion of its already massive transportation service. The success of such a service, however, relies on three main achievements; first and most important is the manufacturing of these airborne vehicles, second is the development of the infrastructure for take-off/landing and third is the authorization by transportation agencies such as the FAA or Dubai’s RTA. Relying on numerous manufacturing and logistics partners, Uber’s plan is to offer eVTOL (vertical take-off/landing) aircraft that will be both lightweight and electrically powered for zero emissions. Their goal is mainly to ease traffic congestion but also reduce travel times, offer a cheaper means of transportation and support sustainability. The company also stated that it hopes to eventually get the cost of a trip down to an ambitious $1.32 per passenger per mile, making it “economically irrational” to even drive or own a car. Dubai’s aerial transportation service is part of their ambitious strategy to have self-driving vehicles account for a quarter of journeys made in Dubai by 2030. Dubai, however, doesn’t plan to wait around for Uber to deliver and has already started the testing process of their aerial vehicles. Partnering with the Chinese company EHang, the EHang 184 AAV has already been seen hovering above the sand dunes near the city's airfield during test flights. According to Dubai's Road and Transport Authority (RTA), Dubai plans for its electric one-seater AAV to start picking up passengers as early as this July. No news yet on whether Dubai will be able to meet this deadline; I personally believe it is quite far-fetched. Airbus is also independently developing an AAV in an effort to ease congestion by taking daily commuting to the sky. As Airbus gets closer to its first test flight, the company has stated that a ride in their vehicle will be as cheap as taking a taxi per mile. Airbus is also the first company to release an expected price for its service, estimating costs between $1.50 and $2.50 per mile. The electric aircraft, called Project Vahana, will also fly autonomously. Airbus’ first prototype is said to have a range of 50 kilometers, however, the final version, which is set to hit the market in 2020, will be capable of achieving a distance of 100 kilometers. With the first working prototype and a July release in Dubai, EHang is leading the AAV race. 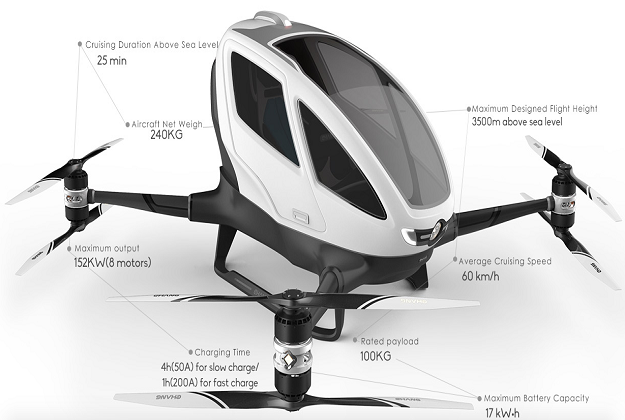 The EHang 184 is fully electric and will have a maximum cruise speed of 100 km/h. While airborne, ground control centers will program routes and will monitor the entire flight through an encrypted 4G network. 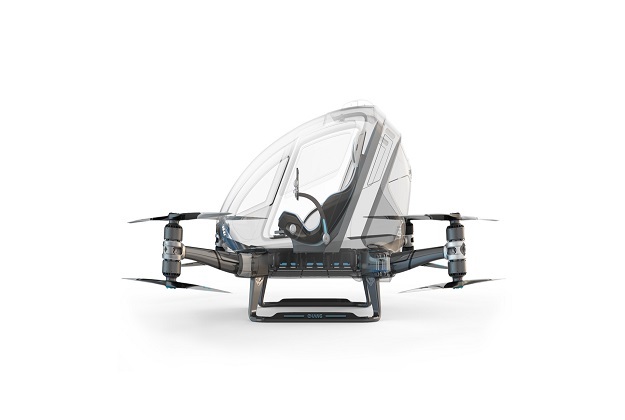 For security and safety, the EHang 184 is designed with full redundancy –if one set of rotors is operating abnormally, the vehicle can still operate normally, follow its flight plan and ensure the safety of the passenger together with the vehicle. 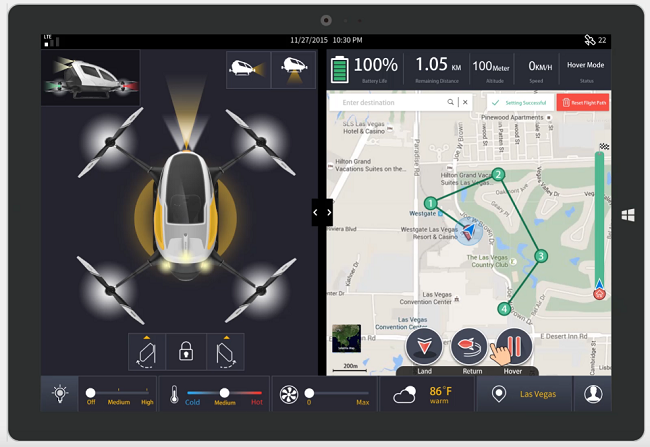 In the case of a critical failure, the EHang 184 is connected online with command centers at all times and is embedded with a fail-safe system. So in the event that any of its components malfunction or disconnect, an emergency protocol will land the aircraft immediately in the nearest possible area to ensure total passenger safety. To help with the EHang’s autonomous landing, designated landing spots are pre-set with the EHang Logo which serve as a guide for the aerial vehicle. The 184 is outfitted with a landing camera capable of pattern recognition which will recognize the EHang logo to provide a smooth and accurate autonomous landing. The 184 also provides passengers with an intuitive application system which is simple and user-friendly – setting your destination is as simple doing so using Google Maps and one click is all that is needed to take off and land. Other vehicle features are also accessible through a basic on/off button interface. Battery technology today does not provide the energy needed for AAVs to overcome gravity. AAVs require massive amounts of continual downforce to simply avoid falling out of the sky. The battery power-to-weight ratio is simply not sufficient enough to power a flying object large enough to transport humans for more than a few minutes at a time. Therefore, until a breakthrough in battery technology, AAV transportation is sadly just a fantasy. It’s safe to say that most of people's concerns with any pilotless aircraft is communication and safety. 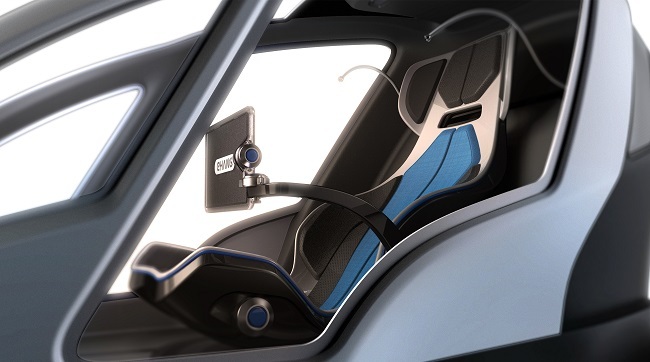 EHang claims that its ground control centers will have full control of the aircraft in case of danger and will be able to send signals and communicate with passengers at all times. However, what happens if that technology is interrupted for some reason? There’s not much the passenger can do at that point. During extreme weather conditions, EHang states that command centers will prohibit any AAV from take-off. But weather can be unpredictable, and the idea of a large, heavy, battery-powered aircraft with spinning blades losing control over urban landscapes just sounds like a bad idea. Electronics are always susceptible to failure which is another grave concern. Aerial aircraft may suddenly break down or even crash into trees, wires, and birds. It’s one thing to build AAVs but setting up the infrastructure to support them is one of the biggest hurdles. In order for such a transportation system to be economical, numerous landing spots are needed. Funding these landing spots will be costly especially in densely populated cities. Furthermore, given that transportation agencies ensure these aircraft meet all federal safety regulations, they still need to figure out where and how they fit into the complex air traffic control system. While automotive technologies like autonomy, electric powertrains, artificial intelligence, augmented reality and machine learning are finally reaching the level of maturity to become truly disruptive, flying taxis have at least a decade before they become a viable means of transportation. Even then, such AAVs will be operated in a very limited scope. Flying autonomous taxis are a long way from commercial reality and they do pose several issues and concerns, however, if successful they do offer a solution to our increasingly annoying traffic epidemic. AAVs may provide us with an alternate taxi transportation service but imagine how many lives could be saved employing emergency passenger drones that could prevent thousands of needless deaths by taking transportation to the skies.